Arka Sharmeeli is an ever blooming floriferous Hybrid T rose identified for garden display. Flower color changes from light pink to different shades of red from bud to different stages of blooming. Flowers are produced in bunches of 2-3 flowers at the tip of long stalks. It is a seedling selection from half sib population of IIHRR- 11 (IC-0617919). On an average it produces 450-500 flowers/plant/year. Flowers are medium size with an average flower diameter of 7-8cm and with 30-35petals/flower. 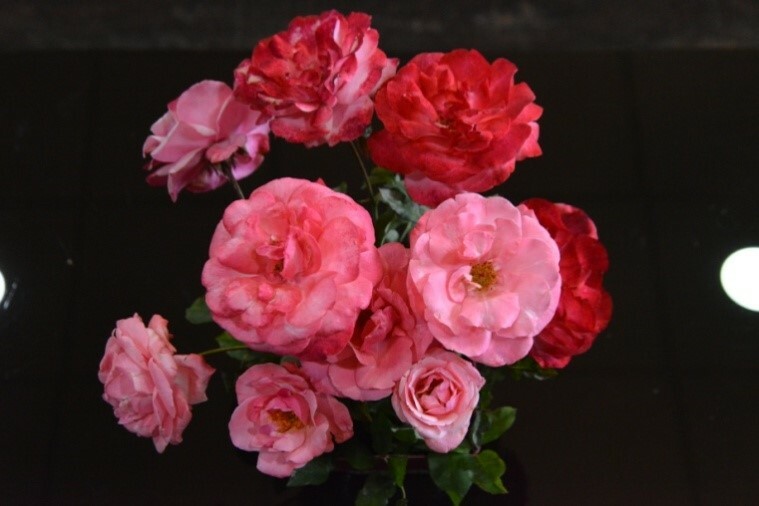 In the initial stage of flower opening, petal colour is of redgroup 50-A and slowly colour turns dark with red group 53-A as recorded with RHS color chart.